We're in our new home, everything is unpacked and put away, curtains hung. After 8 weeks of living off restaurant food and weight gain, we've been eating salads and fruit for the near past 2 weeks in an attempt to lose some weight. Sunday is a working day here, although hubby has decided to work from home today and I've decided to put the kitchen to use. Beef Stroganoff in the slow cooker, bread maker on, apple crumble and blueberry muffins in the oven and some freshly squeezed orange juice, fruit and yogurts for breakfast, now just the washing up to do and popping to the shops and have a coffee while I'm out. 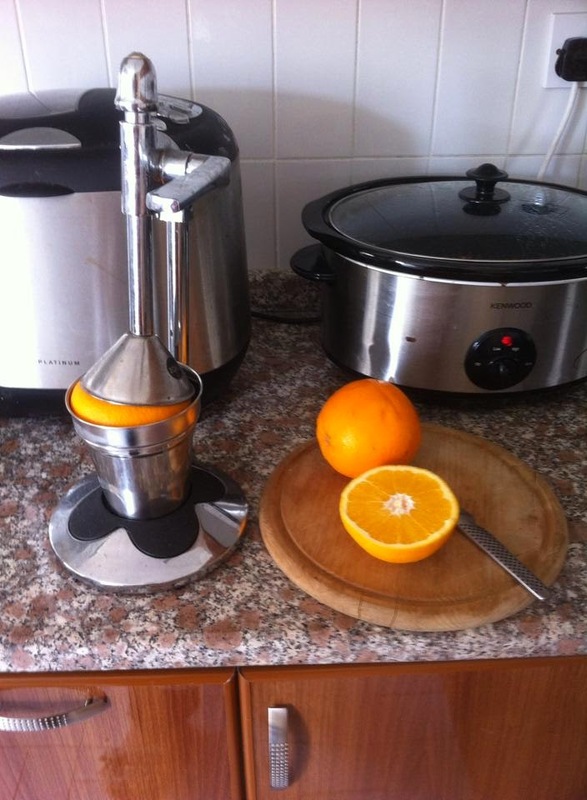 NOTHING like freshly squeezed orange juice. Enjoy! It sounds to me like you deserve that coffee! Sounds like you've been busy. I love your juicer! Nothing beats a glass of freshly squeezed orange juice in the morning. That is a very interesting looking juicer. I've never seen one like it.